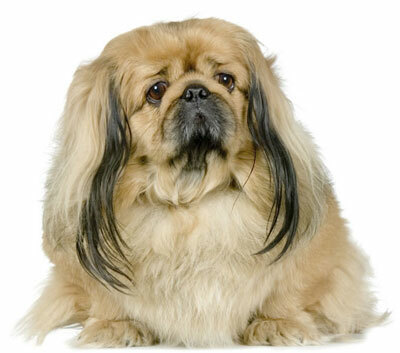 The Pekingese is a proud, confident, independent, and protective dog who is sensitive and affectionate to his owner. He is quite often a one-person dog, and is generally wary and aloof with strangers. He makes a good watchdog because he is loyal and fearless, and he will bark at any suspicious sound or movement. He can sometimes bark too much and be difficult to quiet down. He can be jealous and possessive of his owner, and needs a great deal of attention. In return, he is a wonderful, loving companion who will stand as tall as he can toward you and raise his paws like a kitten. He can be quiet and calm in the house. He is difficult to train, and can be strong-willed and bossy. He will not necessarily come when you call him, and may refuse toys, food, or games when he is being stubborn. He needs to be convinced that training is worthwhile for him. He can be difficult to housebreak. He loves to lie on the couch and generally needs little exercise, but he does like a daily walk. He can be aggressive to larger dogs but gets along well with other Pekingese. He can learn to live with other pets if he is raised with them. He is not an outdoor dog, though he does like to play in a safely fenced area. He is sensitive to heat and cold, and can catch cold easily. His flat face means that his eyes are easily injured, so you should make sure there are no barbs or pointed objects in the yard or house that might hurt him. He can be playful with children but should be supervised with young ones; he is better with older children. He does not like to be disturbed, especially when he is sleeping, and may growl or snap. You must be careful not to feed him too much, because he can easily be overfed. He can be gassy, snorty, and sneezy. He is an extremely heavy shedder, and would not be a good choice if you don't like vacuuming a and finding hair everywhere. The Pekingese is 6 to 9 inches tall (to shoulders) and weighs 7 to 14 pounds. He has a double coat consisting of a long, straight outer coat and a thick, soft undercoat. His coat can be any color--black, tan, cream, gray, red, white, or fawn--and he often has a black mask. He only needs an occasional brushing but because he sheds so much you may find yourself brushing him everyday to catch and reduce the volume of hair in your home. The Pekingese has existed as a breed for over 2,000 years and has changed very little in that time. He was the sacred dog of ancient China, and has been recorded as far back as the Tang Dynasty in the 8th century. He was the privileged dog of the Imperial Chinese Court, and carried by imperial women inside their sleeves. He was sometimes known as the "Sleeve Dog," and also as "Fu Lin," the "Lion Dog." He was first discovered by Westerners when British troops invaded the Imperial Palace in 1860, and sent five Pekingese back to Queen Victoria. "Pekes" also traveled as gifts to America, and the breed was first registered with the AKC in 1906. His AKC popularity was 50th out of 157 breeds in 2007.